Game of the Month awards aren't just about .EXE files! Ancient Shroomba is a fun little ROM hack that Yakibomb made for the 72-hour Dimentio's Demented Game Jam, a Halloween-themed minigame competition with a tight time limit. 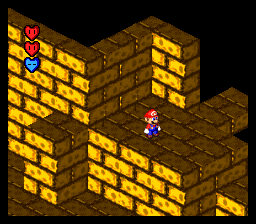 Ancient Shroomba uses Super Mario RPG as a base, but it's very much not an RPG! There are no turn-based battles or misfit bands of adolescents with quirky hairstyles. Instead, it's a platformer where Mario has been deprived of his ability to run and jump! In Ancient Shroomba, Mario goes inside an ancient tomb where the legendary Shroomba - half Goomba, half regular mushroom - has been sealed away, never to be spoken of again until now. It's not the longest game you'll ever play, but who knows - maybe we'll see a sequel/expansion someday. Speaking more broadly, I'd love to see more fangames and ROM hacks that do what Ancient Shroomba does - compact, creative games that take their source material in a fresh and unexpected direction! Also, since we now rotate between new games and community-nominated games for GOTM awards, don't forget to suggest some cool games for the November GOTM in this topic! Congratulations on the award, @Yakibomb! I haven't played it yet, but from what I've seen, it seems pretty cool and well-deserving of the award. I'd really like to play this. Congrats! Looks like a good game. Wow! This is incredible. Thank you so much for this award! I feel like I should give a speech. You've caught me with my pants down! I'm proud I could publish something, even though it was nowhere near the scope I had anticipated. I really surprised myself. Really, thank you for this. I'm glad to see that this is back (albeit a few months late). Congratulations Yaki! Love your dedication to SMRPG! I'm glad this got a spotlight, even if it is late. Congratulations Yakibomb, you did a great job making a unique hack (in such a short time to boot). GOTM topics have often been delayed a month or two. We're doing our best to get them back on a regular schedule, though.